The Cisco 4400 Series Wireless LAN Controller provides systemwide wireless LAN functions for medium to large-sized facilities. By automating WLAN configuration and management functions, network managers have the control, security, redundancy, and reliability needed to cost-effectively scale and manage their wireless networks as easily as they scale and manage their traditional wired networks. The Cisco 4400 Series Wireless LAN Controller (Figure 1) works in conjunction with Cisco Aironet® lightweight access points, the Cisco Wireless Control System (WCS), and the Cisco Wireless Location Appliance to support business-critical wireless data, voice, and video applications. It provides real-time communication between lightweight access points and other wireless LAN controllers to deliver centralized security policies, wireless intrusion prevention system (IPS) capabilities, award-winning RF management, quality of service (QoS), and mobility. 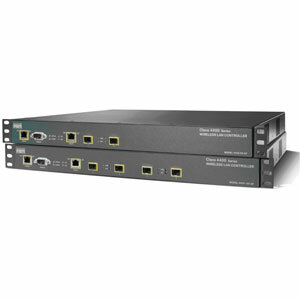 Cisco 4402 and 4404The Cisco 4400 Series Wireless LAN Controller is available in two models. The Cisco 4402 Wireless LAN Controller with two 1 GB Ethernet ports comes in configurations that support 12, 25, and 50 access points. The Cisco 4404 Wireless LAN Controller with four 1 GB Ethernet ports supports 100 access points. The Cisco 4402 controller provides one expansion slot. The Cisco 4404 controller provides two expansion slots that can be used to add VPN termination today, as well as enhanced functionality in the future. In addition, each Cisco 4400 WLAN Controller supports an optional redundant power supply to ensure maximum availability.